Photo: McKibbon House, ca. 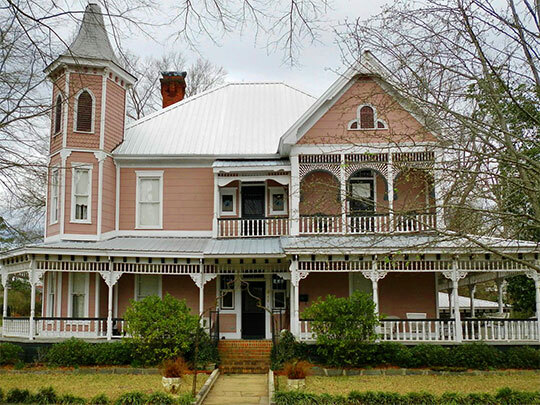 1900, 611 East Boundary Street, Montevallo, AL. Listed on the National Register of Historic Places in 2001. Photographed by User:SaveRivers (own work), 2015, [cc-by-3.0 (creativecommons.org/licenses/by/3.0)], via Wikimedia Commons, accessed July, 2014. The County Administration Building is located at 200 West College Street, Columbiana AL 35051; phone: 205-670-6550. Shelby County was established in 1818 from land that was then part of Montgomery County. It was named for Isaac Shelby, a Revolutionary War hero and the first governor of Kentucky. Until 1826 Shelbyville was the county seat at which time it moved to Columbia. Columbia changed its name to Columbiana in 1832 and the seat of government was then permanently fixed.